One out of four normal healthy people will experience depression in their lifetime. Never mind those of us who get horrific migraines half the time, if you are like me. I can only imagine that most of us migraine sufferers will experience depression more often than we would like to. Dealing with this condition can be very trying at times to say the least. Here is a method I use with some clients to help them acknowledge and shift the depression. Spend as much time as you need at number one, but don't get stuck there. You can set a timer for twenty minutes to help. 1. Acknowledge the mood – say "hello!" 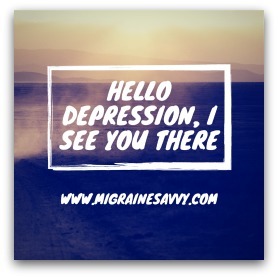 Just for one example: another migraine is on the way so you may feel a number of different emotions – you can say hello to all of them – one at a time. Try saying this to yourself, or out loud. “hello depression (mood), I see you there, I feel you in my stomach." "hello head pain behind my ear and eye." The sensation could be anywhere in your body or outside of your body. If it is outside – good, it can stay out there. 2. Either way put it in a clear bubble, and move it. See it outside of your body, untangle it and once it seems calmer say "I let go of what is not mine." 4. Send what is not yours back to where or whom it belongs. Send it back with love, and ask it to be healed. Divine love and light will do this – all you have to do is ask. You do not have to know who or where it belongs, just send it back with love. Do you feel better now just from reading that? Remember to take at least three deep breaths and allow yourself some quiet space to listen inside before you go back out into the world. Please click here Coping with Migraine to share your answer in the Tips comments box at the bottom of the page. One: I highly recommend reading Cynthia Perkin's Mindfulness Over Migraines e-book that explains the science behind mindfulness and why it helps migraines. And she explains the method step by step that she uses to eliminate her migraines in 15 minutes. Yes, you read that correctly ... eliminate in 15 minutes. It will be the best $6.99 you ever spend! Two: I just started reading this e-book Fighting The Migraine Epidemic: How To Treat and Prevent Migraines Without Medicines By Angela A. Stanton Ph.D. and you know I harp on about being proactive right? This e-book is all about how Angela Stanton PhD. cured ... yup cured her migraines after almost twenty years of suffering. It is about balancing the minerals that cause migraines (you have to get the book to see which ones)! And it has amazing information about migraine causes and symptoms. I will keep you posted on my progress, but for under $5.00 US on Kindle it is worth experimenting with, now. Why wait! My motto is to end needless suffering. As you know pain is very distracting and disruptive. It is very hard to think straight with a migraine even if the pain phase is covered by your abortive, you may still experience confusion or an array of other migraine symptoms. What do you struggle with most? Post your story with those of us who understand completely. The good, the bad and the ugly! 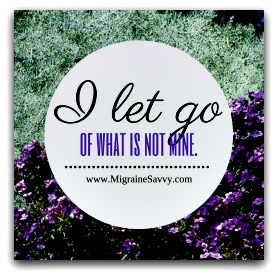 And have your own webpage on Migraine Savvy. I hope you come back and visit us again and again to see what's new. I have the new natural medication for you to read about in the next issue. I am so excited by the new options coming to us. P.S. If you are feeling down you might like to read my post on Migraines Increase Depression or print out the CBT Depression Thought Record Sheet to help you with changing any negative thoughts to positive and realistic ones.